At our tamale party this weekend one of the guests, Julie, taught us to make these Pamonhas de Norte (Northern Brazil Sweet Tamales) & everyone loved this sweet treat full of corn, coconut, bananas & cinnamon. Typically pamonhas are steamed in banana leaves which imparts a green banana flavor to them. 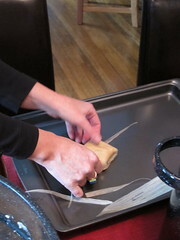 Since we were going to be wrapping ours in corn husks Julie added banana to the mixture. The added banana gives them a moister almost pudding-like texture once cooked (though even without the banana these would not get as firm as regular tamales). You could probably get a firmer finished pamonhas by adding some more masa flour to the mix but we didn't get a chance to try that out. These treats made the perfect dessert for our tamale feast. Thanks Julie for sharing these with us! Yay! This is great - thank you and Julie for sharing this recipe. I hadn't heard of pamonhas before but when you mentioned a Brazilian sweet tamale, I was hooked. I'm bookmarking this right now and checking the pantry to see what I need . . . Sounds like a great party - and looks like a great tamale! Or rather pamonhas! Lori - I was worried what you were going to say when you saw this since I have no idea what pamonhas are supposed to be like. Glad this was what you were thinking of. you come up with the best ideas. I have yet to even make a tamale, can you believe that? 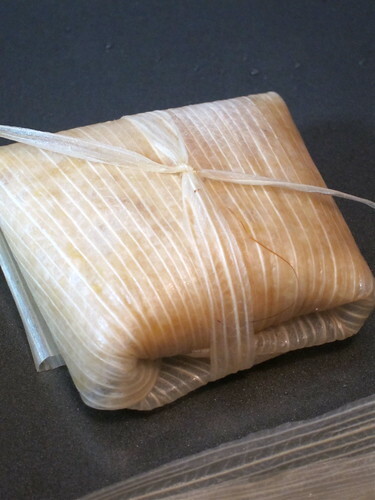 Now, we've made tamales... but we've never made these. They sound delicious! And what a great idea for a party. Sure to scare the winter blues away. corn? hold on. that's not a dessert ingredient. well, it is kinda sweet. okay, kat wins--this'd be AWESOME. I've been in need of a sweet corn tamale recipe like the kind I get at La Loma at Midtown Market... This will tide me over and quite possibly surpass those. Never heard of these, but they look great! Very fun, and how cute that you wrapped them up like a little present. Ooooo! This looks quite delectable! I have a cookbook that is just on tamales, but I have never made any before. I've never seen a sweet version like this - they sound wonderful! I never heard of these before. A good idea!